My bag’s contents vary on a weekly basis. If I’m working on my food website or attending a lot of technology or social media events, I usually have three cameras on me (a Sony Cyber-shot, a Flip Mino and a Kodak Zi8). If it’s a crazy time at work, as it is for me now, I have my Blackberry on me (in addition to my ever-present iPhone). If I’ve been traveling, anything goes; magazines, scarves, cords for my electronics and luggage claim tickets galore. At any given time, there are about 6 kinds of chapstick or lipgloss. I can’t live without the stuff. As many of us refocus on getting organized and ridding our lives of clutter for 2010, I wanted to finally snap a shot of my bag for the Flickr pool. It’s a fun way to memorialize a relatively calm couple of days before work craziness takes over my life again next week. Click the photo to see notes on what everything is in this picture. And while you’re there, check out some of the other photos. What’s in your bag? Leave a comment here. Better yet, take a photo and add it to the Flickr pool and include the link in your comment or Twitpic it to me (@EmilysPearl). Wishing you a Happy New Year that’s as full as a busy NYC girl’s bag! This entry was posted in Stuff I Love and tagged branding, Life, nyc. Bookmark the permalink. So glad you enjoyed the post and the photos. I can’t WAIT to see what’s in your bag with all of your traveling and technology! Good luck on the move and please link back here when you do the photo so we can all see. Thank you! Happy New Year! I was supposed to leave a comment a couple of hours ago but a nap was calling me, HARD, and I listened. My bag contents on a regular day do not usually include a TomTom and Bluetooth accessories. I have been traveling and received the TomTom for Christmas. I usually have a cream hardback notebook and a blue pen to jot down notes and pertinent information. The 2 Christmas cards on the left, I received from my Mom and Uncle they were very sweet and I teared up a bit when I read them so I decided to keep them with me for a while. 3 tubes of gloss: I love it and each reps a different mood. I tend to carry a camera around for no other reason than: What if? I drive my friends crazy with it. TomTom is such a funny word. What brands are the glosses? One looks like Philosophy. 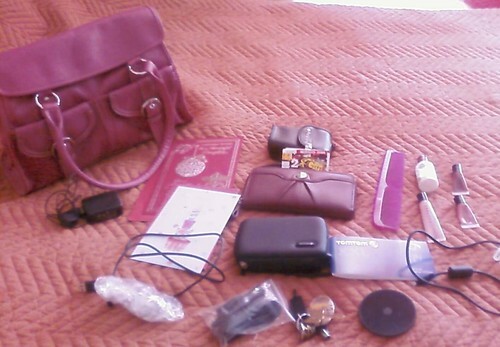 Pingback: Sukhjit 3.0 » Blog Archive » What’s in your bag today?